I guess it’s back to the overnight oats. When juice shops started whipping up fresh, antioxidant-packed açaí bowls a few years ago, everyone freaked out. In addition to being delicious, the gorgeous, painstakingly styled bowls were topped with granola and fruit and claimed a long list of health benefits. Before long, the Brazilian superfood dish was dominating our Instagram feeds. And we get it: Who wouldn’t want to chow down on something that looks and tastes like ice cream, but is actually healthy for you? While these bowls do tend to be high in antioxidants and fiber—making them an undeniably better breakfast choice than, say, a donut or chocolate croissant—let’s talk about the sugar levels. 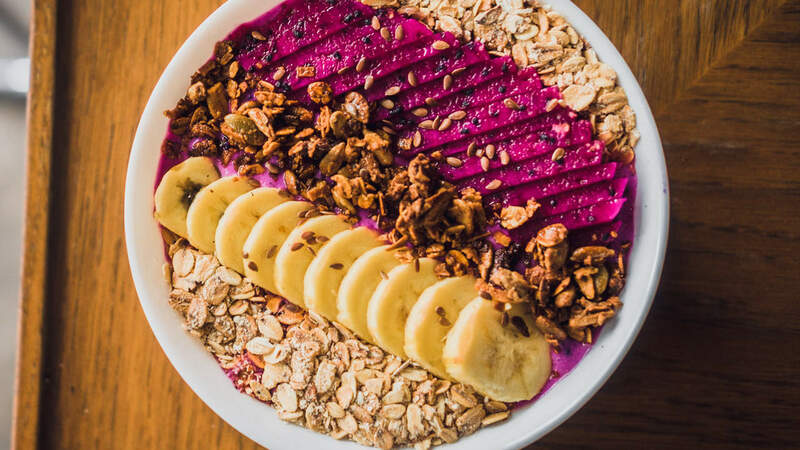 A quick look at the nutritional information for açaí bowls at popular juice spots in New York City shows that they can have anywhere between 21 and 62 grams of sugar in a serving. In other words, total sugar bombs. That doesn’t mean that all açaí bowls are bad for you, but they’re not created equal, experts say. Health‘s contributing nutrition editor Cynthia Sass, MPH, RD tells us that it really depends on how they’re mixed and how much you have. “Portions are key,” she says. “Even if everything going into your açaí bowl is clean and healthy, this dish can prevent you from losing weight or lead to weight gain if it packs more than your body can burn or use.” This is especially true if you’re buying store-bought açaí bowls drizzled with decadent toppings like chocolate—some may even top 1,000 calories, she says. But if you want to slip into something sweet for breakfast, you don’t have to completely quit these bright purple bowls. “Fresh açaí berries are very rare in the United States, and most bowls are made with either powdered açaí that has been freeze-dried or frozen açaí pulp,” Sass points out, adding that while it is possible to find unsweetened frozen açaí, it tends to be bitter and is usually sweetened. When buying açaí bowls, “ask what type of açaí they use, and if it’s sweetened with added sugar, and look at the nutrition information,” she says. You can also make açaí bowls at home to control the ingredients and portion sizes. We’re partial to this recipe, which calls for powdered açaí like Navitas Naturals ($ 23; amazon.com)—this brand contains just one ingredient, certified organic açaí powder, and has zero added sugar. And to boost the overall nutrition of your bowl, Sass recommends using unsweetened nut milk, a protein source (such as Greek yogurt or nut butter).